The most noticeable feature of the WPRichSnippets plugin is the ease of use. Once you configure the plugin settings; a new post meta box will show in your page editor. The Rich Snippets post meta box allows you to easily insert markup, review and rating details to your entries like posts, pages and custom post types. Start with selecting a Schema type from the drop list. As you can see below; we’ve got Rich Snippets for Review, Product, Organization, Restaurant and other types covered. We will be adding more schema types in the future plugin releases and updates. 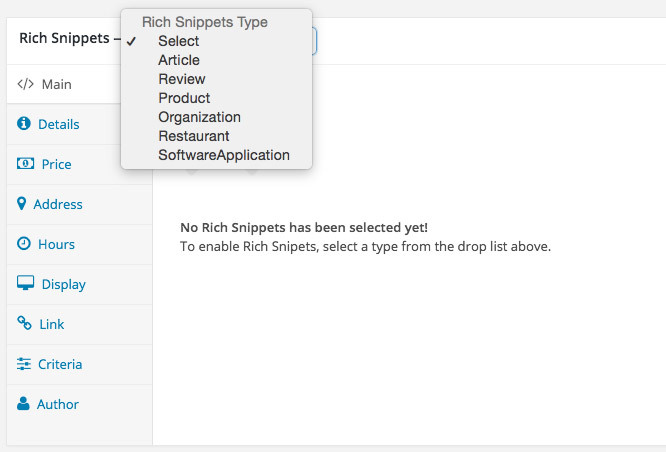 Once you select a Rich Snippets type, the required fields will show in the Main tab. The first option in the main tab is for Review type, you can select one of review types presented in the plugin (example: rating, percentage, votes, aggregate and none), the last option “none” can be used if you don’t want to add review markup to the entry. 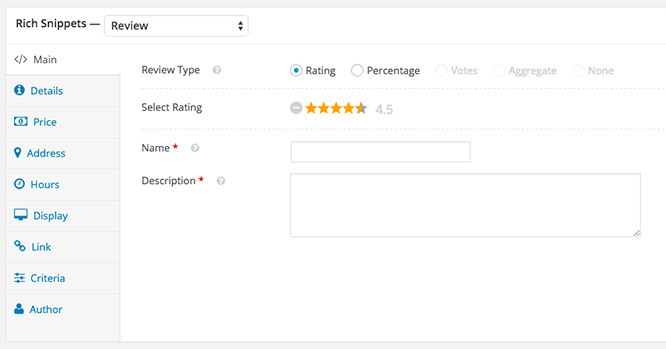 Note that Review type radio buttons will be active only when supported by the Schema type you have choose. Mostly; fields of the first Main tab are required for the markup to work, so try to fill all fields where it says (Name, Description, and select a rating), then save/publish your post, and you are done. You’ve just created your first review. Yes, it’s super easy! All other details are not required, but it adds extra markups to your page, which is really good thing.